Hampi – a UNESCO world heritage site is a perfect destination for back packers looking for some walking and trekking excursions in miles of river side rustic ruins, ancient temples surrounded by Palm trees, banana plantations and lush green paddy fields. Hampi was the capital city of powerful hindu empire Vaijanagara who ruled south India between 1343 to 1565. 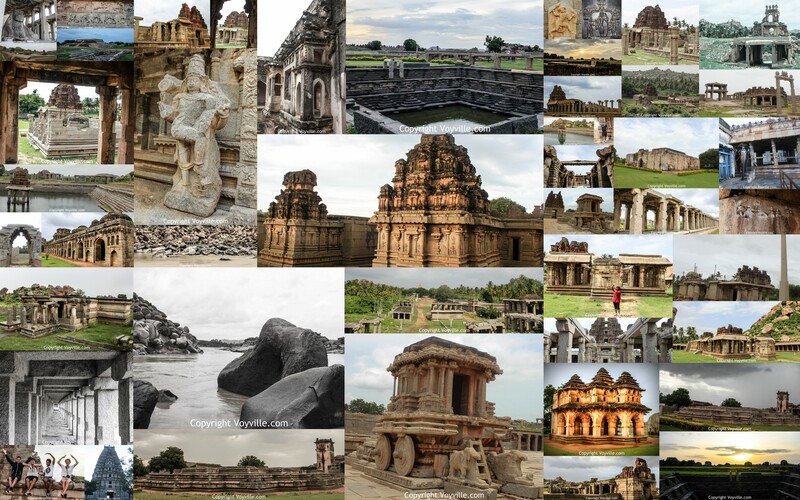 Exploring ruins of Hampi on walk or cycle with map and camera in hand will definitely mesmerize you. Spread across 26 square KM, the vast open air museum is filled with historic temples, ruins of beautiful palaces, aquatic structures, monuments, giant boulders and fortifications. You will need two to three days to immerse yourself in the history, architecture and religion of Vijayanagar empire. Hampi is located in Karnataka State of India and is about 320 KM / 6 hours drive from Bangalore. There is good rail and bus connectivity from Bangalore to Hospet (nearest railway station). There are plenty of budget and luxury hotels near Hospet railway and bus station. Hampi is 12 KM from Hospet.